International superstar DJ and producer Tiësto has announced the launch of his brand new “AKG by Tiësto” range of headphones. Comprised of three distinct models, the range will be released globally in June 2012. AKG®, a Harman International company, is an Austrian based leading manufacturer of microphones, headphones and wireless-equipment and has been the trusted brand by high profile artists, sound engineers and music aficionados worldwide ever since its foundation in 1947. AKG® aims to stand for the best sound quality rooted in the passion for music with a unique image for design and style, providing the best sound performance and reliability within the range of professional audio application. AKG’s excellence in sound has been honored with several awards including the TECHNICAL GRAMMY® Award in 2010. “As a DJ and producer, my aim is to always give my fans a breathtaking audio experience that they'll never forget. I decided to join forces with AKG as they understand that giving the best possible sound reproduction is key to this experience. AKG are rooted in the passion for music at the same time as having a unique eye for design and style. 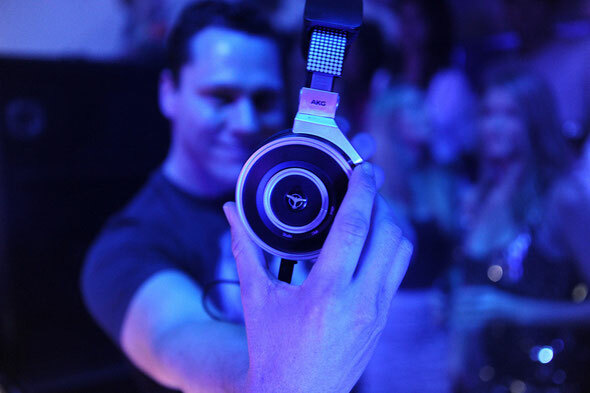 Together we’ve created a line of headphones that are perfect for those who want the best quality of sound, but don’t wish to compromise on style, whether you’re looking to mix in the studio, perform live or even listen when you’re on the move,” Tiësto says.